For the first time in over 30 years, nuclear reactors will be built in the United States. 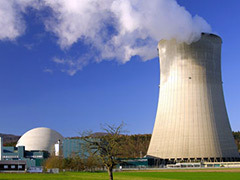 The government has passed a loan guarantee for several billion dollars in order to fund the development of two reactors in the state of Georgia. The White House has advocated an “all of the above” strategy that includes nuclear power among the carbon-free energy sources it views as viable. While the Obama administration exudes optimism over the lower carbon emissions in its nuclear energy initiative, the Georgia loan - which would eventually guarantee a combined $8.3 billion to three separate power companies in order to build the reactors - is already coming under fire by staunch environmentalists. Two of the three companies - Georgia Power and Oglethorpe Power - have already optioned $6.5 billion, while another $1.8 billion will likely go to Municipal Electric of Georgia, which has yet to complete the steps for their proposal. All of the funds are being committed to an extension on the Vogtle nuclear power plant near Augusta. The costly nuclear venture has been on the backburner since 2010, but Energy Secretary Ernest Moniz proudly finalized the deal in February of this year. Although a large disconnect exists between environmentalists who consider nuclear power destructive to the natural world, and the government, which feels that nuclear power represents a clean, safe, and practical energy source, it appears nuclear energy is here to stay for the foreseeable future. Posted on April 2nd under Pollution Reduction.